As far as animated musicals go, Moana is about as good as it gets. If Frozen signaled Disney was getting its musical mojo back, Moana (pronounced Mo-ahnah, not Moan-ah) confirms it. This one very much falls in line with Beauty and the Beast and The Little Mermaid, released during Disney’s “golden period” of the ‘90s. As the music kicks in, it becomes easy seeing this one getting a big push from Disney out on 42nd Street, an unusual Broadway companion to Hamilton. Why Hamilton, the headline-making sensation? Lin-Manuel Miranda, the show’s creative genius. Yeah. Miranda — collaborating with Opetaia Foa’I and Mark Mancina — lifts Moana’s material from potentially simple children’s tunes to songs packed with wit and substance. In short, Moana is a feast for the eyes and the ears. And, by the way, it’s directed by a veteran Disney tag team, Ron Clements and John Musker. They crafted the aforementioned mermaid movie as well as Aladdin and others. Catchy songs and gorgeous visuals can only take a movie so far. Moana is buoyed by a really good story and two strong lead characters. And, yes. One is a young girl, the titular Moana. If there was nothing more to the idea than baiting the politically correct looking for greater gender and ethnic diversity in animation, Moana would’ve felt forced. It flows like the ocean. 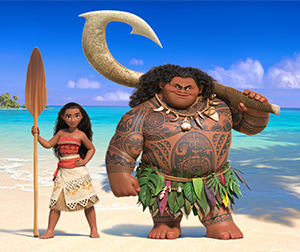 During the story development process, Disney created the Oceanic Trust, an entire organization dedicated to capturing a robust sense of Polynesian culture, history and linguistics. While the story digs deep into Polynesian lore and life, its themes are still universal. That’d come as absolutely no surprise to Joseph Campbell. Ultimately, it’s about following your bliss and thereby becoming your true self. Moana (voiced by 16-year-old newcomer Auli’i Cravalho), you see, has wanderlust. The ocean calls to her, but her own tribe continually reels her back to terra firma. Her boundaries are set by an intransigence that refuses to look beyond the immediate situation. Even as the lagoon is purged of the last fish, Moana’s father won’t let her go beyond the reef. No one is allowed to go beyond the reef. The action is vivid and imaginative, with one particularly entertaining setpiece involving a warrior tribe of costumed coconuts (called Kakamora). They’re encountered during Moana’s ultimate mission: to recruit the demigod Maui (voiced by Dwayne Johnson, yes — “The Rock”) into returning a magical jewel to its rightful place. Doing so will relieve a curse that’s fallen upon Moana’s home island. With a screenplay by Zootopia’s Jared Bush (working with a story credited to seven additional storytellers), Moana sets sail on a journey that emphasizes perseverance and accomplishment and the story works exceedingly well on all fronts. Maybe the tide has turned once again in animation. With Toy Story, Pixar shifted the scene from musicals to gorgeous digital animation and witty stories with loads of heart, but now Disney is once again flexing loads of creative muscle, riding on the waves of success generated by Frozen and Zootopia. Pixar (granted, now owned by Disney) seems to be escalating its own cannibalization with loads of sequels, including this year’s Finding Dory, with Cars 3, Toy Story 4 and The Incredibles 2 all on the drawing boards. No doubt the varying sensibilities and styles will be able to co-exist. That, after all, would be the politically correct thing to do.